Prominent & Leading Manufacturer from Pune, we offer mayur jet fountain. Our competency lies in manufacturing an excellent quality range of Mayur Jet Fountain. Further, we can also design these in specifications as demanded by the customers. Mayur Jet Fountain/‘Ball Fountain’ offered by us looks similar to ball fountain where all nozzles are fitted on the ball. 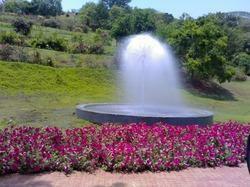 Our offered fountains are available for the customers in different sizes and number of streaks of water.